Whichever it was, my friends and I didn’t care. (We hardly cared that it happened at all, to be honest. We were just glad it didn’t happen to Quizno’s.) And from that day on, for us local students, a ho-hum mystique enveloped the House of Glunz. The Boo Radley to our Scout Finch, the Mr. Mertle to our Sandlot gang, except the Glunz name neither frightened nor tempted us with a lifetime supply of baseballs. We took twisted pleasure in being persona non grata because we were shy, studious kids and because they had nothing we wanted that our bum ally couldn’t purchase at the corner store. Not much changed even as we grew up. That is, until recently. 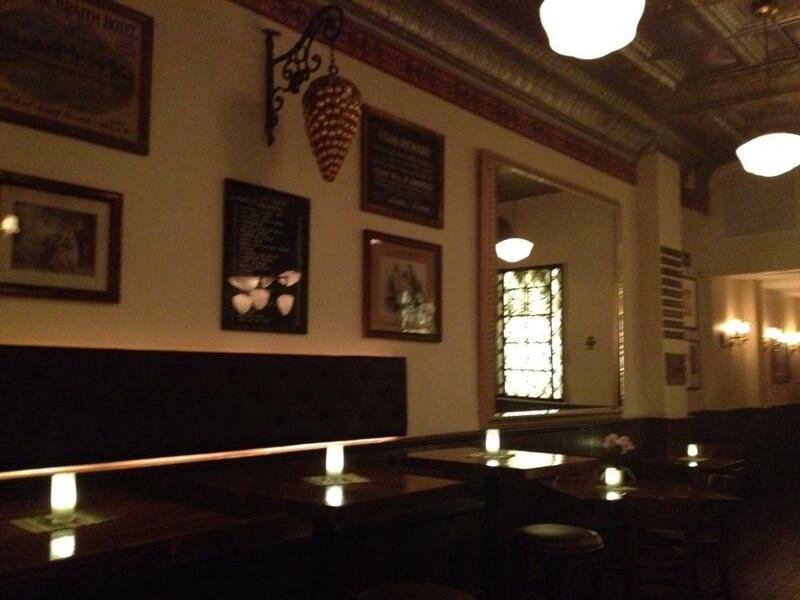 The Glunz Tavern reopened at the end of 2012 in the original space next door. Once a favorite gathering place for residents of Old Town and the Gold Coast, it had closed more than 90 years ago, just before Prohibition. And save for small classes and tastings in recent years, the tavern was little more than a storage space until last winter, when Barbara Glunz and her son Christopher Donovan (granddaughter and great-grandson of Louis Glunz I) brought it back to life and invited guests in for the “true tavern experience that [had] been absent from the city since the pre-Prohibition era”. Having developed a greater appreciation for Chicago history – and for enjoying a nice drink somewhere other than a dingy basement or college dorm room – over the past several years, the refurbished Glunz Tavern caught my eye immediately. And it was only fitting that I brought three of my high school comrades with me. We took four stools at the bar – a small, mahogany structure in the 19th century Brunswick style – and tried our best to look inconspicuous. Somewhere deep down, I still felt a lingering twinge of paranoia (the exhilarating kind), despite having had nothing to do with the infamous incident. In my mind I was the distant associate of a notorious outlaw, and the tavern’s Old Chicago theme would play right into this fantasy. As is often the case, though, I had it all wrong. I was expecting a vibrant atmosphere, yes, but it was far less gimmicky than I had imagined. This was not the place to reenact a scene from The Untouchables. And despite the historic Chicago accents – chairs and tables salvaged from the Berghoff, a large mirror from the old Ambassador East, a chandelier from the Red Star Inn – the concept was more a respectful nod to the past than a full-on journey back in time. 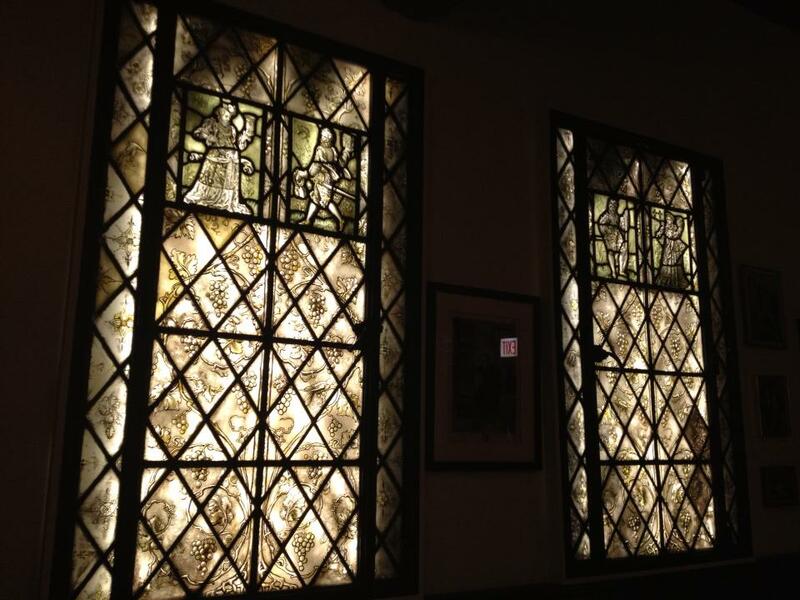 Together with a collection of 18th century European stained glass windows, which emitted a comforting sepia-toned glimmer from the back of the dining area, the motif was classic but not tired or contrived. There were casually-dressed diners enjoying a late dinner, individuals seated at the bar with books and laptops, young couples whispering sweet nothings and holding hands over their corner table. Everyone seemed completely at ease. 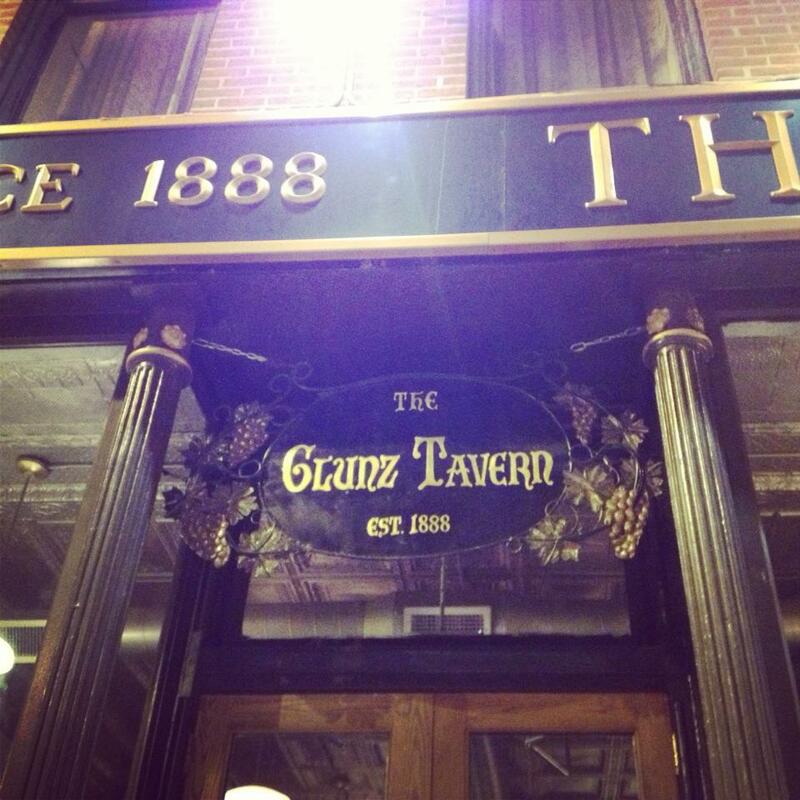 On this night, calling the Glunz Tavern a place “to gather with friends for cocktails and familiar fare” was as true as when it first opened in 1888. 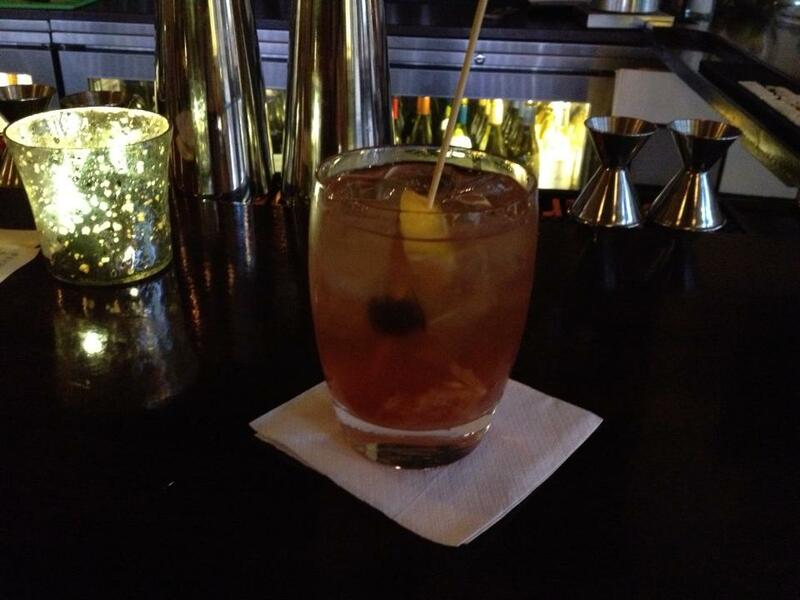 Bartender Darren mixed an impeccable Old Fashioned – made with George Dickel Rye and real maraschino cherries; one of the best I’ve had – and his grizzled yet unpretentious sense of humor was a welcome addition to our evening. He schooled us on the specifics of the French-German-Alsatian-Austrian menu, recommending several delightful creations from Consulting Chef Allen Sternweiler. 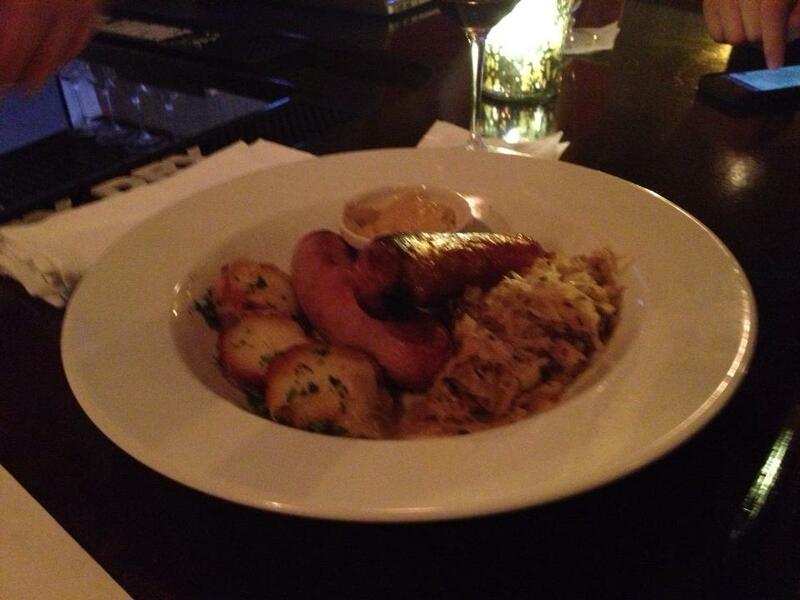 The Bavarian Bratwurst and Smoked Thuringer (served with home-cured sauerkraut) was at once elegant and comfortable, a reflection of the tavern itself. And the Charcuterie Board (complete with prosciutto, French sausage and smoked duck breast) paired beautifully with a carefully selected red wine. As I walked out of bar and onto the sidewalk, I turned around to face the building’s windowed façade. And for a moment, I became the juvenile rock-slinger, trying to get inside his mind. The panes were inviting, the target was wide, and no century of history could stop the cocking of my arm. Historic as it was, the House of Glunz was still a wine shop. 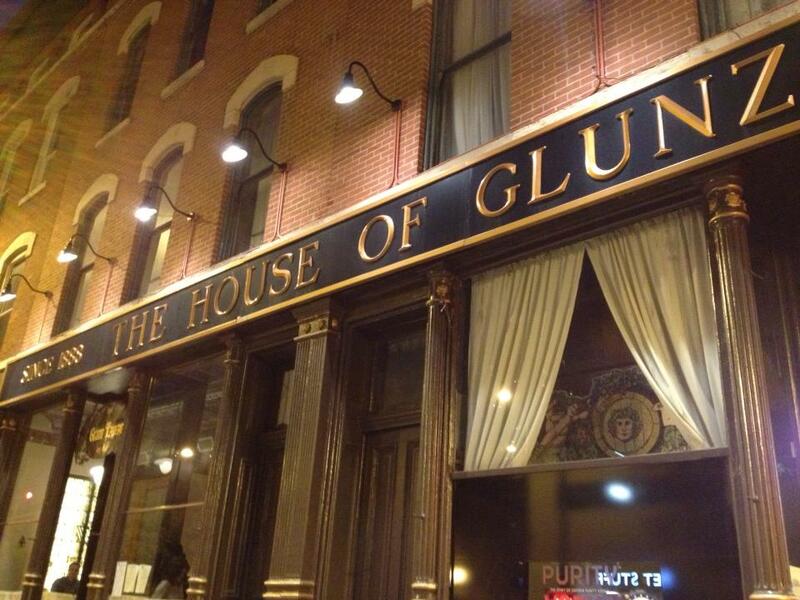 The Glunz Tavern, however, was alive. It had a collective pulse, and the patron-space interplay produced a more sensory, stimulating experience than any retail outlet could hope to achieve. Even through windows, this was apparent. I dropped my imaginary stone and went on my way. Such is the power of the true tavern experience.